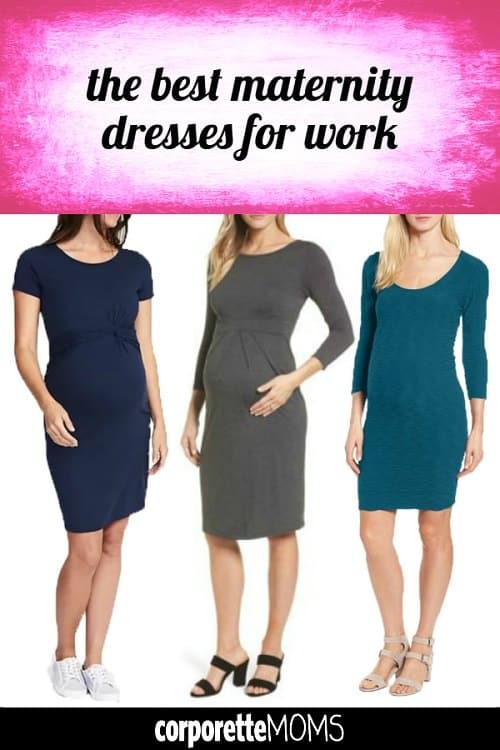 2019 Update: We still stand by these dresses as some of the best maternity dresses for work — links have been updated below. If you’re far enough along in your pregnancy that you’ve outgrown your regular-sized, old-standby work dresses and have realized you need to expand your maternity work wardrobe to actual maternity wear, fear not — today we’re rounding up the best maternity sheath dresses for work, many of which we’ve included over the years in our regular maternity workwear recommendations. 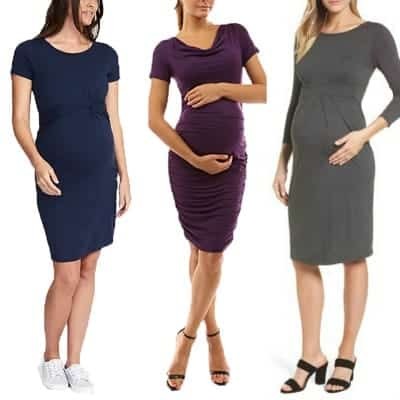 We’re featuring options from the more affordable end of the spectrum (a possible strategy if you’re planning to be one-and-done) to higher-quality maternity dresses that will last you through two or three (or more) pregnancies. 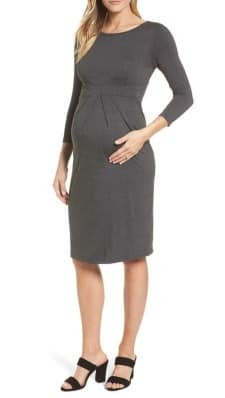 What are your favorite maternity dresses for work? Do you ever choose double-duty styles that are meant for pregnancy and nursing? When you buy maternity dresses, do you tend to buy a few that are higher-quality or buy a bunch of less expensive ones? (Does it depend on how many kids you plan to have?) Which of your “regular” dresses have been particularly pregnancy-friendly? What do you think are the best maternity dresses for work? This simple and very affordable maternity dress — in a cotton blend with a bit of stretch — is from Old Navy. It would work for a more casual day at the office if you add the right accessories and would also be a good option for the weekend (say, for one of those pre-baby date nights that you should load up on right now). It’s not entirely plain, though — it has a fun little twist at the front. The dress is a bestseller at Old Navy and has lots of positive reviews — and not surprisingly, it’s machine washable. It’s on sale for $26, down from $36.99, and it comes in navy, black, and “blaze of glory,” which is (obviously, right?) sort of a dark coral. 2019 Update: This exact dress has unfortunately sold out, but Old Navy is still one of our favorite places to look for affordable and stylish maternity dresses for work! Has anyone actually worn an MM.LaFleur dress both during and after pregnancy? Did it keep its shape or (permanently) stretch out in the belly area? my mm lafleur dresses worked through about 1/2 way through the 2nd trimester, except the casey which lasted most of the way through the second trimester. so longer than my other non maternity clothes. but after that — no. then again, im short and i gained almost 50 pounds so ymmv. My best dresses came from Motherhood Maternity. They were a stretchy material that wasn’t super formal, but had good patterns that dressed them up a bit. There was ruching with a side twist type detail (I think). Cap sleeve. I don’t see them on their website anymore. I had two and would have liked a third but only had 5-6 work maternity outfits, so decided three of the same dress was a bit much. And they were only like $40 regular price. I found a few good maternity dresses from Gap and Macy’s recently. The one from Gap are wrap dresses that are perhaps a little on the more casual side, but I can get away with that in my office. The ones from Macy’s are Motherhood Maternity and Jessica Simpson brands. They were all very low cost, which I appreciate for clothes I’ll only wear for a few months. I got MMLF Adrienne and Georgia dresses and two jardigans and have worn them from 14 to 28 weeks. Perfect for my federal jury trial, client meetings and comfortable enough to wear all the time. Plan to wear them all the way through and post partum. Worth the money. Seraphine and other T-shirt dresses w my regular blazers or the jardigans are working fine. Recently used Thred Up to get some trousers and a Seraphine dress. No issues. I’ve gotten a ponte dress from Old Navy in two colors, and it’s my favorite maternity dress so far. (29 weeks) Comfortable, nice fabric, nice enough for work, not body-con, and room to grow in the belly. I’ll put a link in a reply. 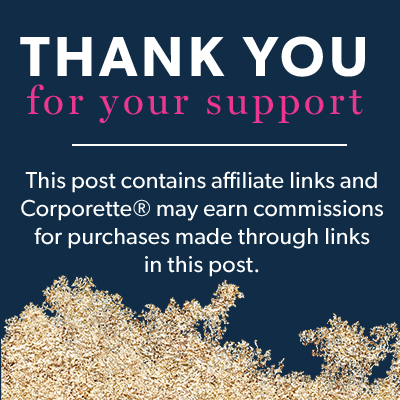 I bought a bunch of work dresses from Seraphine (their sale section was great(. I preferred basic dresses that I could accessorize multiple ways with scarves and jewelry.